My essential skincare includes cleansing, face mask, exfoliating, moisturizing, and using an acne scar treatment product. My skincare routine is straightforward; I advise that you know what your skin type is and get a personalized routine. For people with oily skin, it can be difficult to know what products will work for your skin. You won't believe how much money I spent in the past trying different products to get a personalized skincare routine for my oily skin. After years of trying various products, I was able to narrow it down to buying products with Benzoyl Peroxide for washing my face, Shea butter/Kojic Acid for fading acne scars, and Clay Mask for acne. There are so many ways to fade acne scars. Face peels, Microdermabrasion, Exfoliation, Derma Roller, Glycolic Peels among other methods. I have always stayed away from invasive techniques when it comes to fading my scars from acne. 1. Exfoliation ~ I exfoliate once a day. Exfoliation helps to get rid of all the dead skin, dirt, and oil that accumulates on my skin. It contributes to revealing newer and healthy skin and also it helps to absorb my skincare products better. 2. 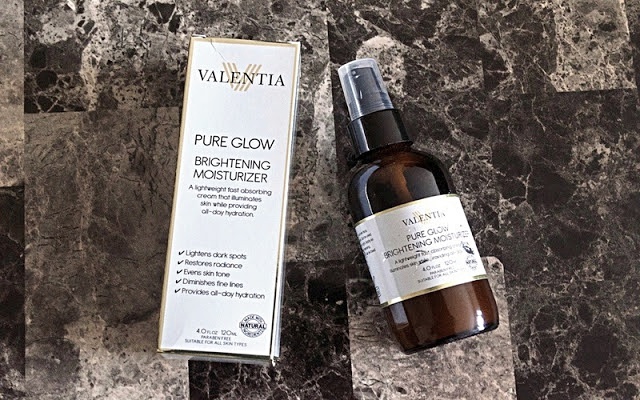 Brightening Moisturizer ~ I have been using my Valentia Pure Glow Brightening Moisturizer to fade my scars. Valentia glow is an all natural moisturizer and does not contain harmful ingredients such as Hydroquinone. (Do you know hydroquinone is banned in Europe? You can only get it at a doctor's office with a prescription). Valentia moisturizer is formulated with selected ingredients to help achieve optimum results. 1. Botanical Hyaluronic Acid ~ Floods skin with moisture, Supports skin elasticity and plumps skin from within. 2. Kojic Acid ~ Controls melanin production and prevents dark spots. 3. Ginseng ~ Boosts skin, firms collagen, fights wrinkles and gives the skin a brighter and more energized look. 4. Safflower oil ~ Repairs skin's natural moisture barrier and provides superior skin protection. 5. Shea Butter ~ Infuses skin with a myriad of vitamins and nutrients for superior skin hydration and nourishment. I like to use products that have natural ingredients. The moisturizer is packaged in a glass bottle with a pump. It is easy to dispense, and three pump of moisturizer is enough for my face and neck. It has a light scent and suitable for all skin types. It comes in a 4.0 Fluid Ounce bottle; that's a lot to last up to three months or more. You will instantly notice the hydration when you apply the moisturizer. My skin is radiant and toned. Using the moisturizer in conjunction with exfoliating is working well for me. **Important ~ As with all skin treatment product, It takes up to 4-6 weeks to see significant improvement.